Archimedes Center for Medical Device Security: Click Here to Download Your AVEA Ventilator Software Update. Trust Me. Update 1: The CLEAN MX realtime database offers further details on the infection. According to CLEAN MX, the web server was infected with the "JS/Redirector.JL.1" virus for 1666.3 hours from March 23, 2012 to May 31, 2012. CLEAN MX appears to have evidence recorded of the gbfhju.com/r.php SQL injection attack on the viasyshealthcare.com website. You can find the evidence of malware by searching the archived HTML source for "gbfhju." This particular SQL injection attack malware hit hundreds of thousands of websites earlier this year. Also, the Department of Homeland Security wrote to me that according to http://web-sniffer.net/, the site seems to be running an old version of .NET. Update 2: Hat tip to Shawn Merdinger who points out that CareFusion appears to violate the spirit of its own legal disclaimer concerning not to "post or transmit any information or software which contains a virus, trojan horse, worm or other harmful component." It also says, "By using the CareFusion.com web site, including any software and content contained therein, you agree that the use of the Site is entirely at your own risk.... THIS DISCLAIMER OF LIABILITY APPLIES TO DAMAGES OR INJURY CAUSED BY ... COMPUTER VIRUS." This technique reminds me of Riegel vs. Medtronic, but so much more efficient when a manufacturer can simply disclaim malware liability in medical device software. 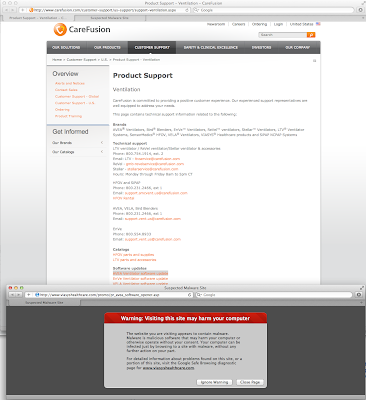 Did you contact CareFusion about the malware on their website? 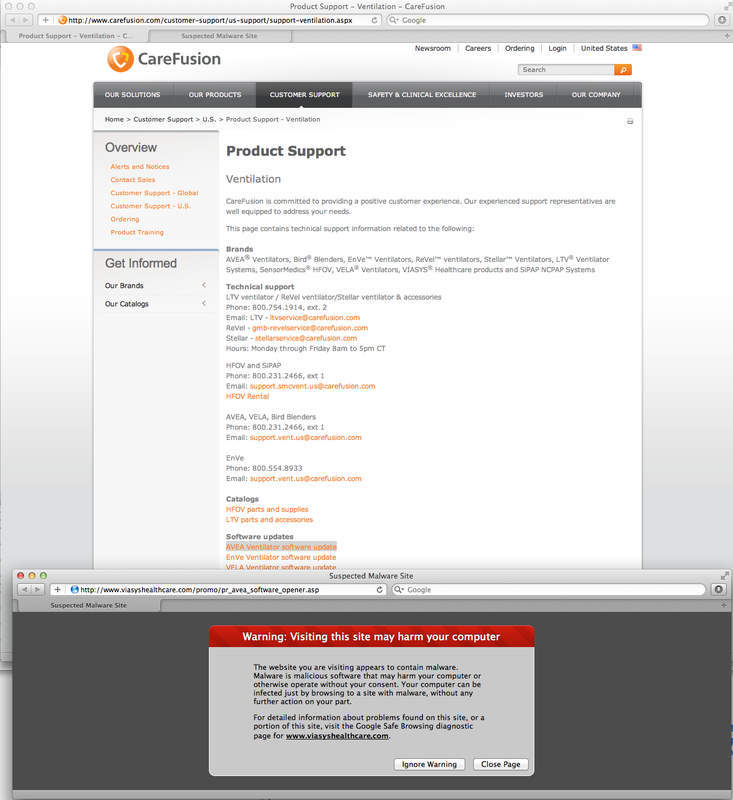 I wrote to security@carefusion.com but the email bounced back as undeliverable. Searching for "security site:carefusion.com" results in several URLs. Clicking on the "Manufacturer Disclosure Statement for Medical Device Security" search result leads to an "Error 404: the page you have requested cannot be found." That's assuring. I did report the problem to FDA; however, there is no effective national or global process for acting on such cybersecurity reports for medical devices. The reports get mixed in with general adverse event reports, and incidents with known injuries or deaths usually receive more swift attention. The NIST Information Security and Privacy Advisory Board points out that current medical device reporting methods are not designed to capture indicators of medical device cybersecurity problems. It's a systemic problem of both government and industry, and is not unique to CareFusion. Anyhow, Google's Safe Browsing service has been advertising the malware infection for months. One wonders how many hospitals ignored the browser security warning when downloading the ventilator software. Does anyone have a list of all of the specific URLs that infected/loading exploits? Alas, I am not aware of any actionable information to help HCPs on your question of establishing trust in this particular software update. It's tricky to manufacture software distribution in a trustworthy manner. However, an SQL injection attack typically means the entire website (rather than a single web page) is vulnerable to tampering. For your other medical devices: ask your vendor how you can verify the authenticity, integrity, and freshness of medical device software downloaded over the Internet. If the answer does not involve peer-reviewed cryptographic techniques, then be extra skeptical.